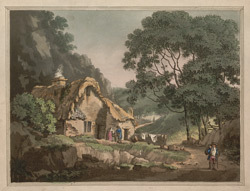 View of a cottage at Crabtree in Devon. Crabtree was a hamlet on the borders of Egg Buckland parish. The parish was a few miles outside of Plymouth.